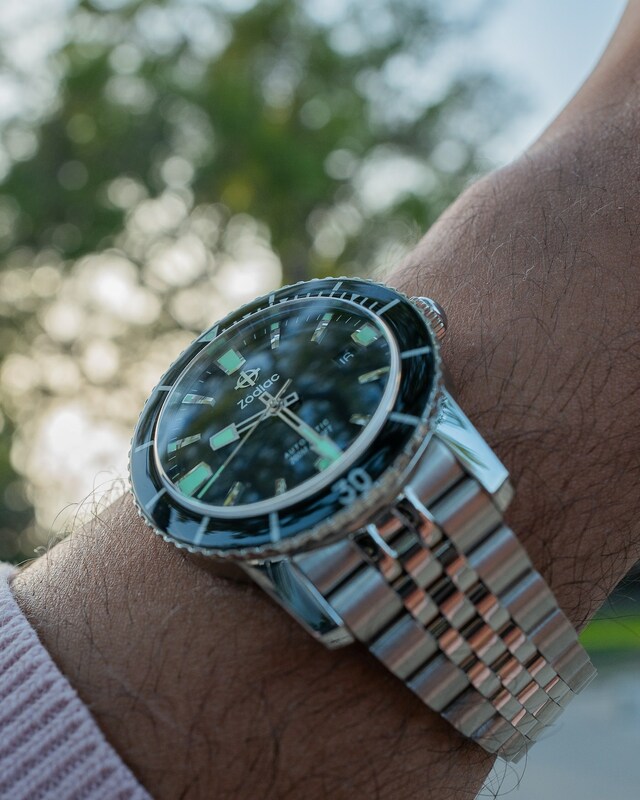 1953 saw the release of the Zodiac Sea Wolf, Blancpain Fifty Fathoms, and the Rolex Submariner (technically in 1954), which were the first three dive watches marketed to consumers. That’s a big deal, though not one was pushed on us much by the brand, which in itself is impressive when you consider current watch-industry marketing trends. 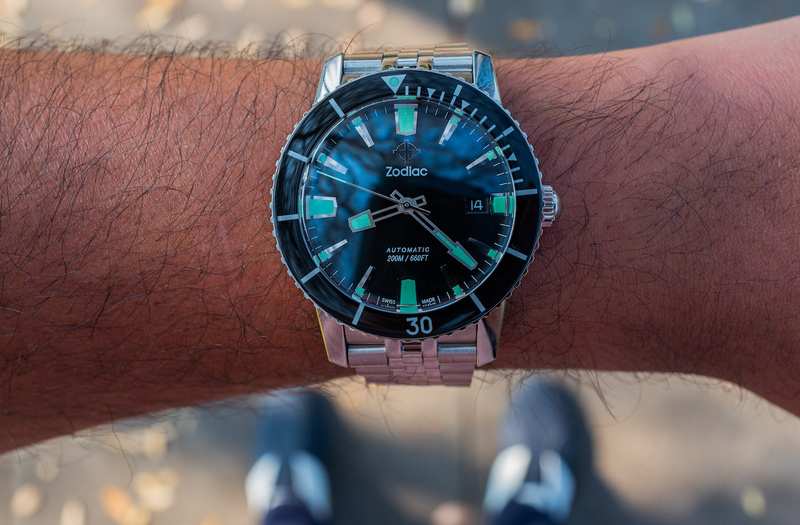 It was about five years ago now that Zodiac resurrected the “Heritage” line, which included the watch I’m looking at here, the non-limited edition Zodiac Super Sea Wolf 53 Compression dive watch. 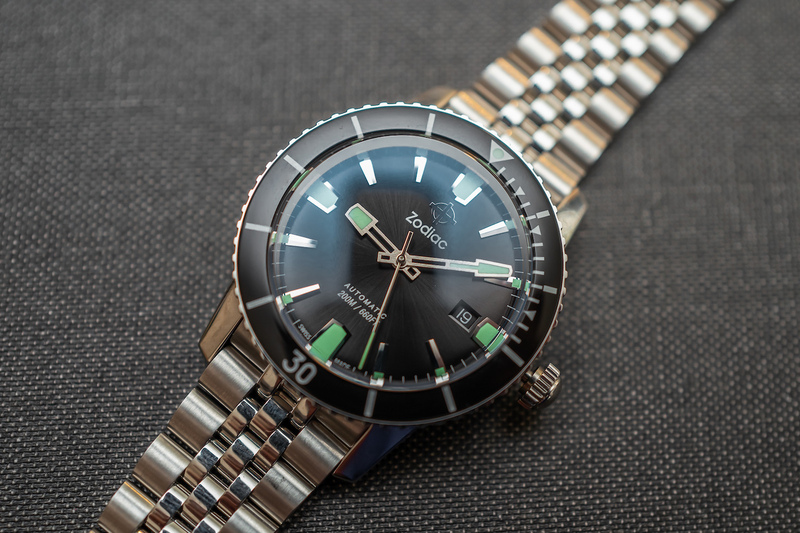 This isn’t based on the first Zodiac Sea Wolf, which had a metal bezel and triangle-shaped hands, but rather another early model featuring the acrylic bezel (mineral glass on this contemporary version) that began production sometime in the late 1960s. 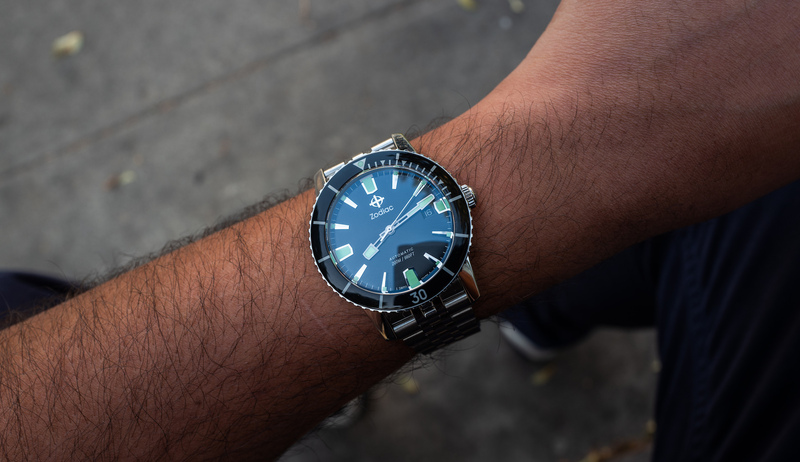 I believe the nomenclature has shifted a bit, as this watch was referred to as the Zodiac Sea Wolf Compression 53 when it was introduced. Now Zodiac has consolidated naming conventions, and all the Sea Wolf pieces are also under the Super Sea Wolf umbrella. A bit confusing, but this is the ref. 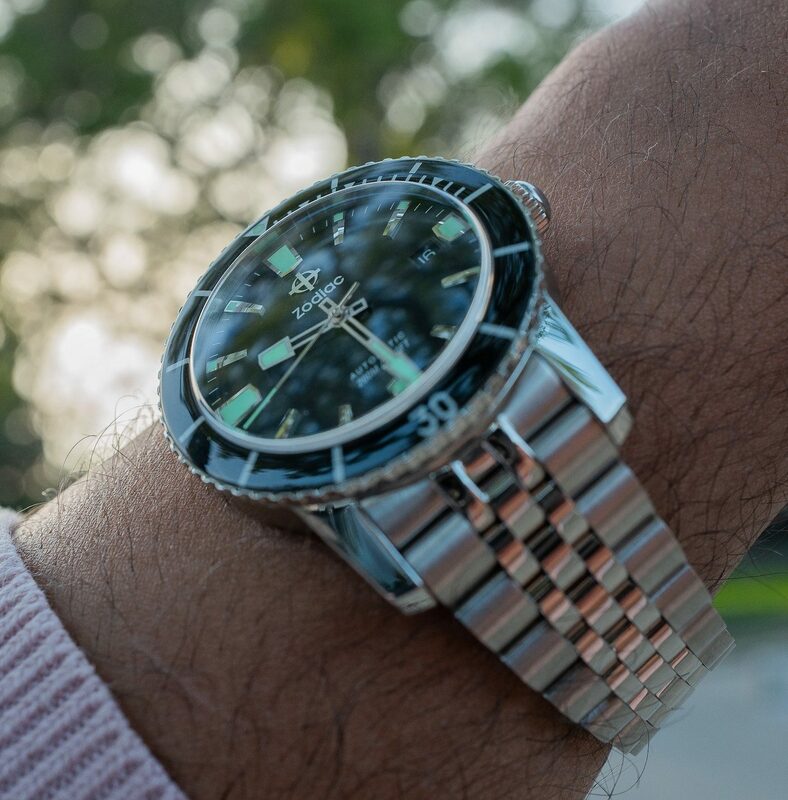 ZO9250, featuring a sunburst black dial with green shovel hands and indices on a five-link Jubilee-style bracelet. 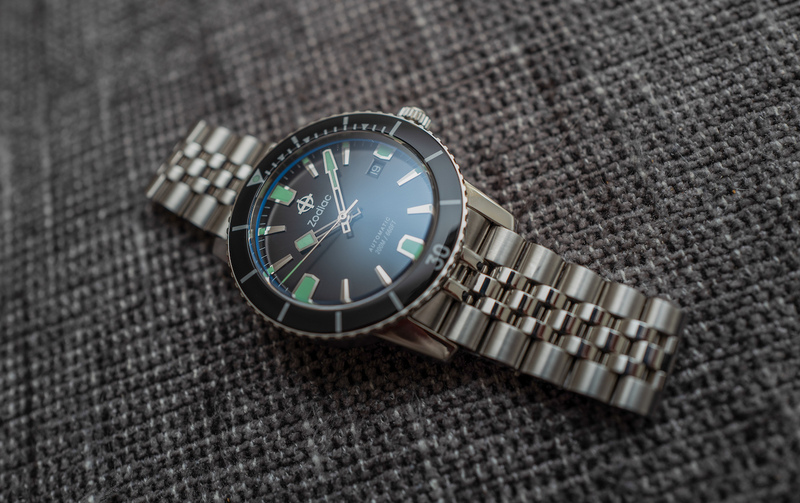 Of course, the brand being Fossil-owned, the watch runs on an in-house STP 1-11 movement that adds to the truly unique value proposition this $1,295 watch offers. In 2019, so many heritage or vintage-inspired reissue watches are becoming an absolute nightmare to purchase, due to reasons such as intentionally manipulated scarcity and price speculation. It’s just starting to get boring at this point. On the other hand, this Zodiac carries a vibe that will just make you smile and enjoy it, anyway. Go ahead, maybe scratch the bezel; you can easily fix it. And enjoy watching your friend struggle a little with the clasp the first time around. It all adds to the fun and personality of the watch. The case measures 40mm-wide and 14mm-thick, but given the lug-to-lug measurement of a hair over 47mm, it wears on the bigger side. The screw-down crown is distinctly styled with that curve that, fortunately, doesn’t hinder the grip. 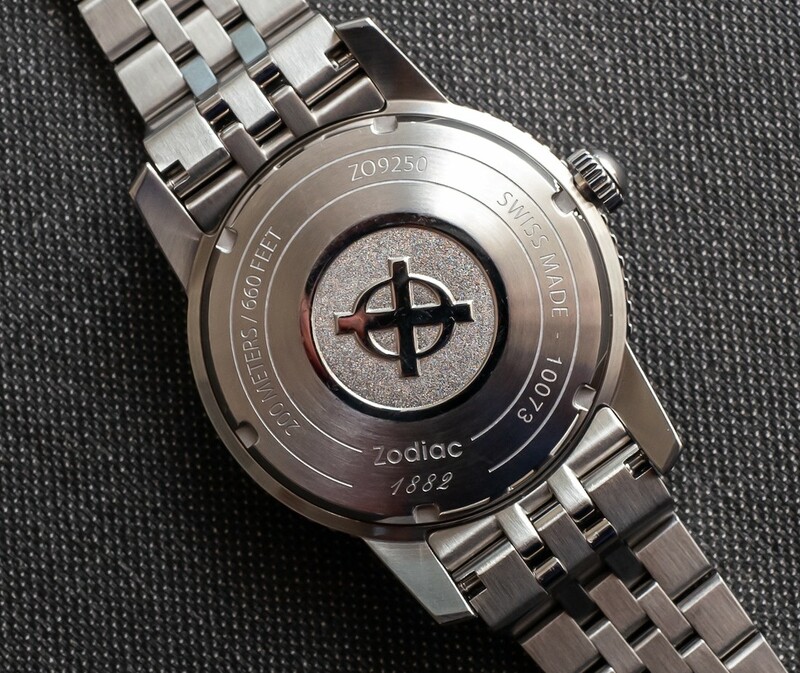 Finally, the engraved steel caseback has that the Zodiac logo that I’m glad has gone unchanged. Of course, we can’t forget about the bracelet, which always generates some opinions in every comment section of a review. To recap, it’s a Jubilee-style five-link steel bracelet that foregoes a deployant clasp seen in most contemporary divers for a hilariously vestigial push-button clasp. After a few days with the watch, I picked up the technique pretty easily, and it’s a fairly short learning curve. I do have to share this Monty Python clip below because it’s all I could think of the first few times I tried to close the clasp. I’ll present it without further commentary. 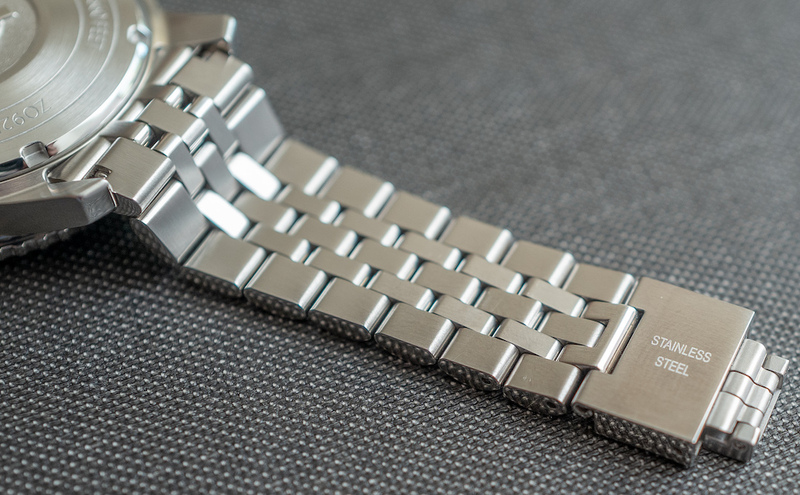 But anyway, once you get the hang of the system, the bracelet, itself, is super-comfortable on the wrist, partly due to the spring system in the clasp that allows for natural expansion without manual adjustment. At the end of the day, I really do enjoy this bracelet because it is comfortable, good quality, and yes, it’s just something different. Sometimes things don’t have to be as practical as possible, but just offering something different can make up for it. Everything about this watch is quirky and authentic to its identity, and the bracelet is a big part of that. 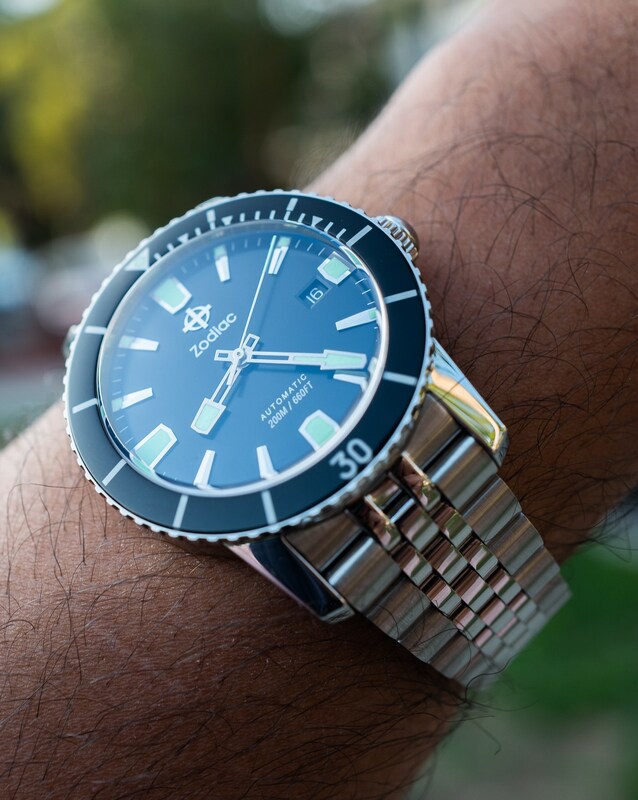 Every watch doesn’t have to be optimally ergonomic or up-to-date; the charm of the Zodiac Super Sea Wolf hinges on its unconventional personality. Like wearing suspenders rather than a belt, it’s just something that is a little different and adds variety to a hobby that can feel increasingly homogenous. I’m not without complaints, though, as one practical issue was far from charming to me. Resizing the bracelet is pretty difficult and finicky, due to each link having both a pin and a collar through the center links. It was exceedingly tricky, though I did manage, eventually. My advice? Just have someone do it for you, and make sure it’s the right fit while keeping the aforementioned expansion from the clasp spring in mind. All movements used in Zodiac watches are STP (Swiss Technology Production), which is the Fossil Group’s manufacture in Switzerland. If you’re interested in the details of what goes into an STP movement, I highly recommend reading about our visit to the facility. 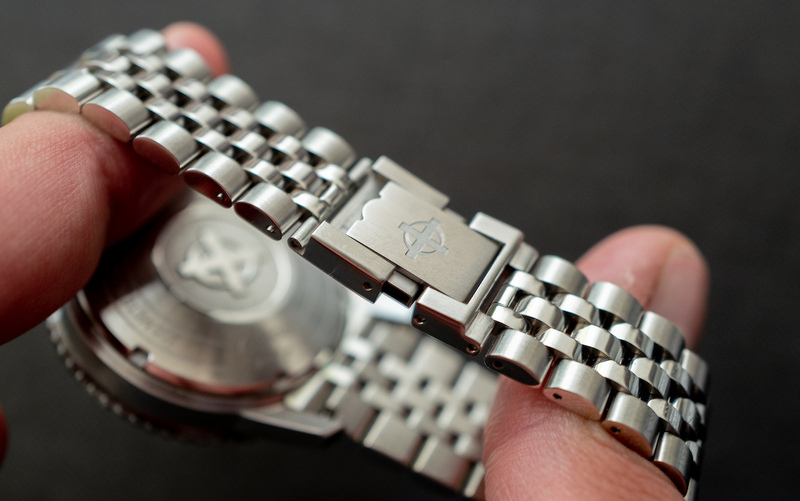 The movement used in this watch is the STP1-11, which operates at 4 Hz and has a 44-hour power reserve. This is Fossil’s high-volume “workhorse” movement, produced in their STP manufacture, and it is otherwise unremarkable. However, Fossil having their own movement manufacture empowers Zodiac to create date windows that match their corresponding dials. This model has a black dial, so the date window is also black. 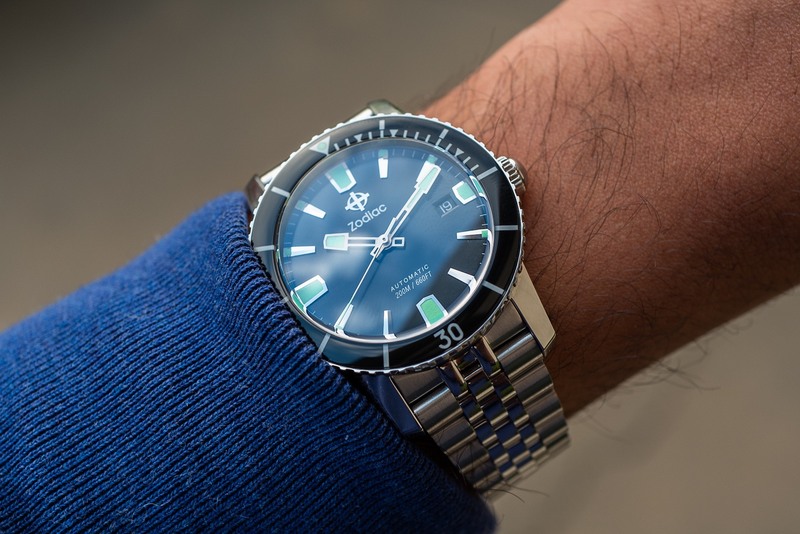 However, there are Super Sea Wolf 53 Compression watches with matte white, sunray silver, matte blue, and matte black (as opposed to sunray black) dials that come with a corresponding date window. 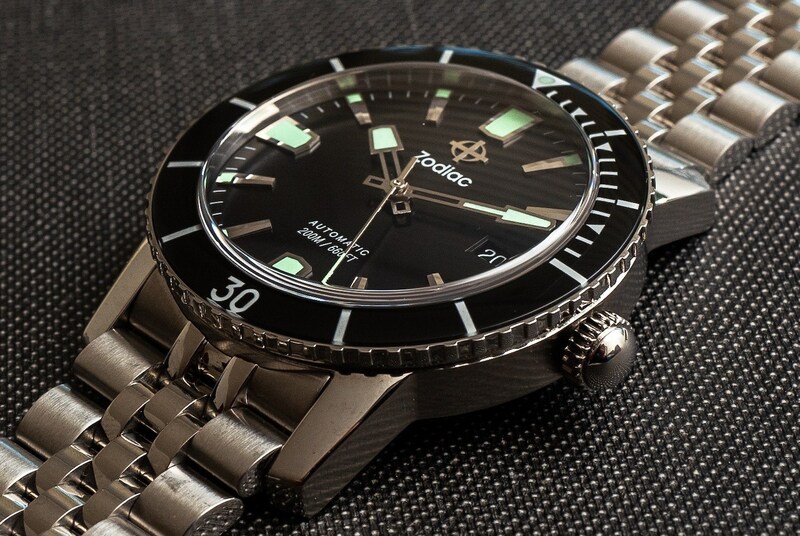 Frankly, it’d be a lot harder for me to honestly say what I’d do about the mineral glass bezel and bracelet if the watch came with a mismatching date window. It’s a very fine line, and Zodiac doesn’t cross it. The dial is pretty straightforward here, done in a black sunray pattern with highly legible green hands. I really enjoy the shovel hands here — again, they’re unusual yet very legible and not at all distracting. The applied Zodiac logo and applied indices look great when you hold the watch at an angle, and the dial text is fortunately kept to a minimum, as well. I previously discussed the date window, and it’s something I don’t even really notice unless I’m specifically checking for the date. The C3 SuperLumi-Nova used on the hands and indices is very bright and warrants no complaints, either. 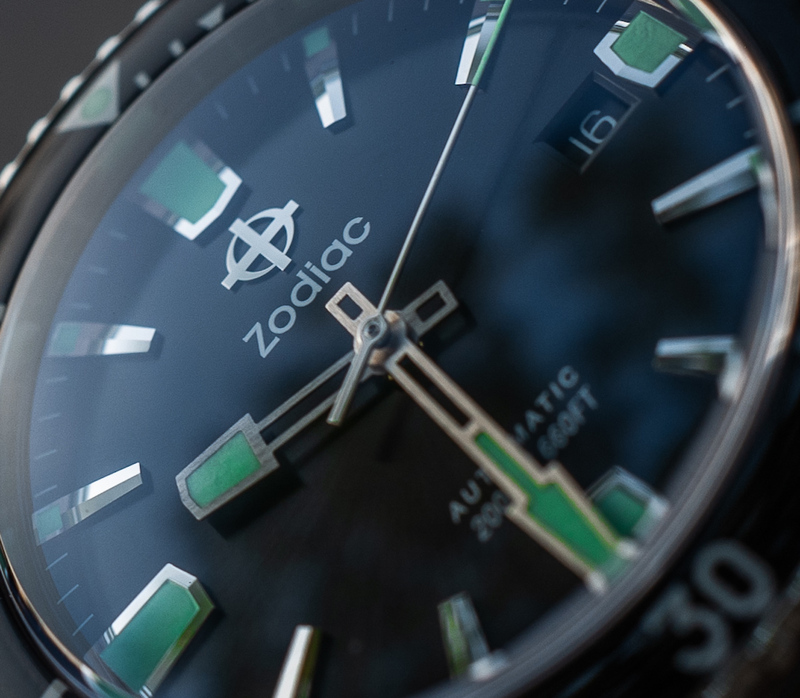 Zodiac took no risks with legibility, and the sapphire crystal over the dial has a healthy amount of anti-reflective coating. 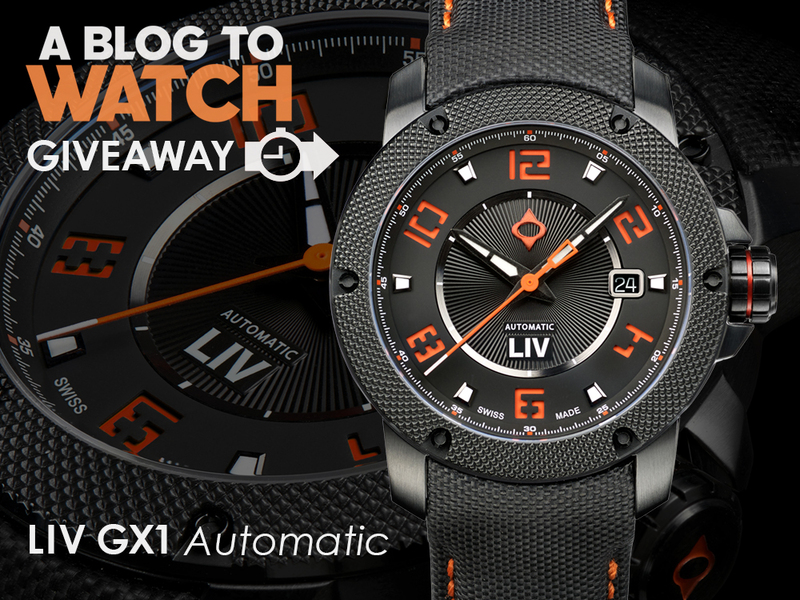 So, what are my final impressions of this watch? If you can’t tell by now, I’m a huge fan. 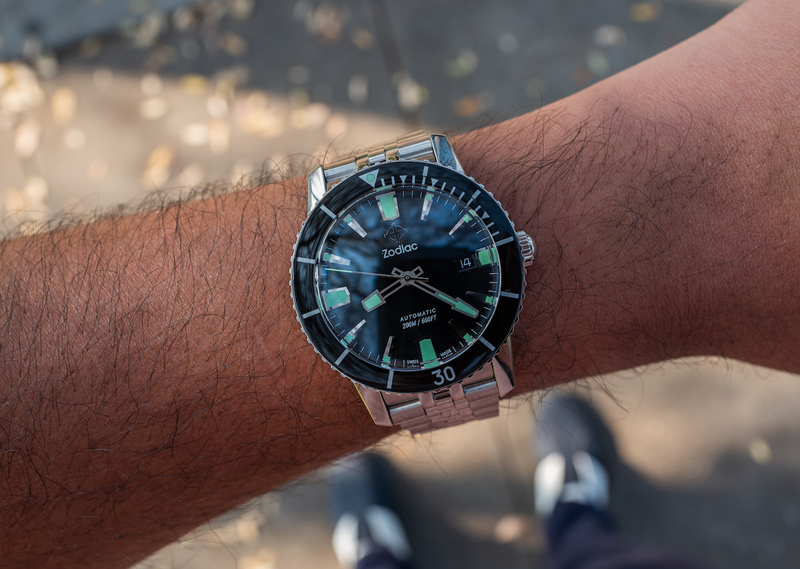 It’s just idiosyncratic enough to stand out without being obnoxious, tapping into the design style and aesthetic of a seriously cool vintage dive watch. 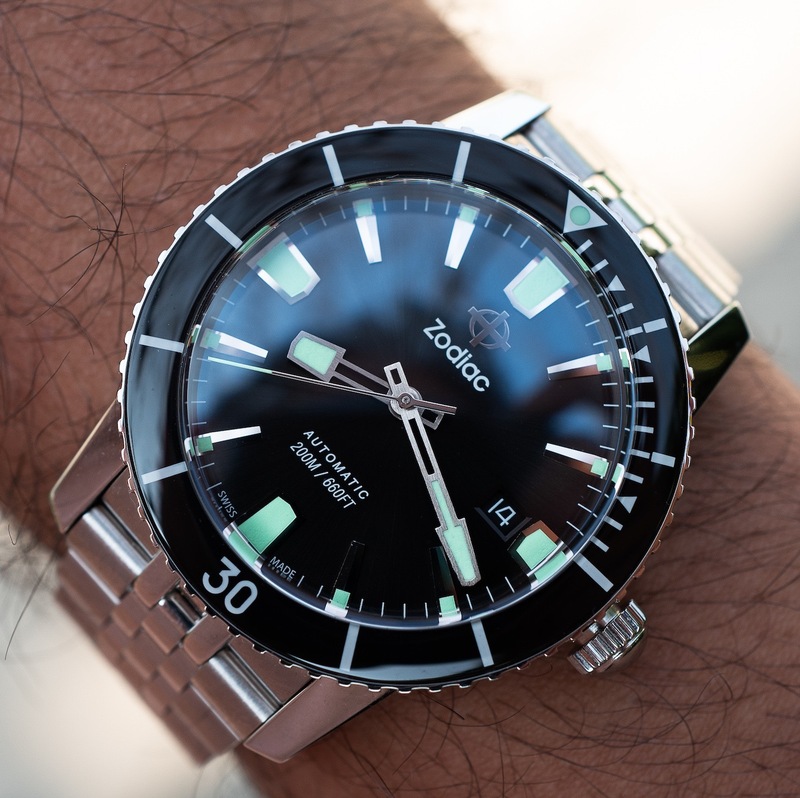 For a price of $1,295, this is one of the best and most versatile “weekend watches” out there. It’s not cheap, by any means, but it’s also not prohibitively expensive (especially when you consider how much you’re getting, including the movement). You can learn more or order from the Zodiac website here. >When reviewer would personally wear it: 100%. I am right now, in fact. >Friend we’d recommend it to first: Someone looking for their second mechanical watch that allows them to be a little more fun and show some personality. 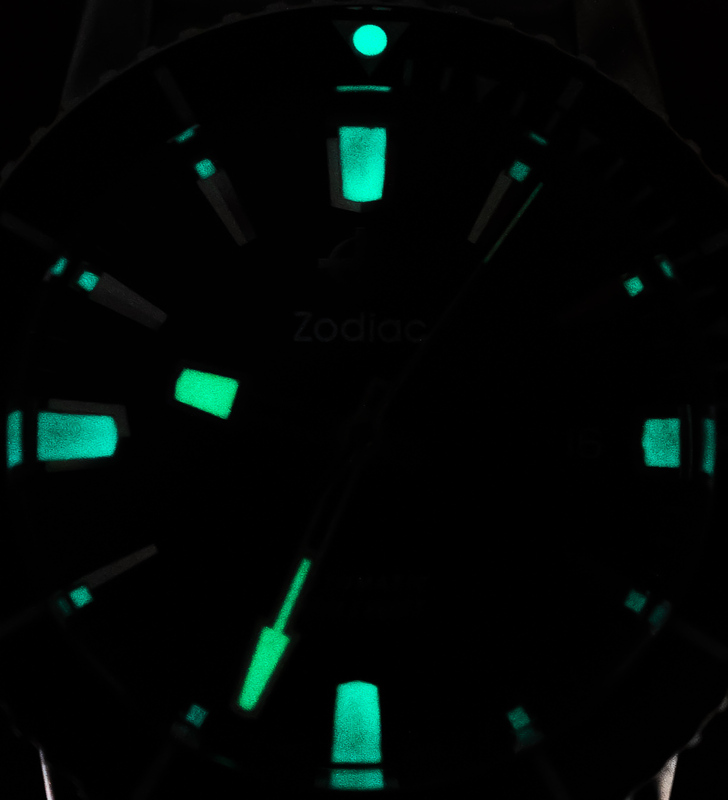 >Best characteristic of watch: It remains true to what makes the Zodiac DNA special. >Worst characteristic of watch: The mineral glass bezel and bracelet will be hurdles to falling in love with this watch, but minor ones. This looks wearable, fun and reasonably priced. 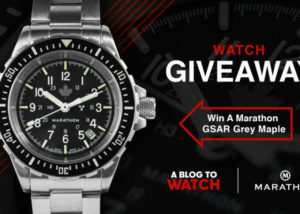 I get crap from my friends about this, but i would consider a $1200 watch to be a weekend beater. Mineral glass bezel doesn’t bother me the least. Every watch I have ever owned, and will ever own, gets scratched. There’s no way anyone should consider paying full retail for this watch. Since Zodiac introduced the line, it’s been possible to find most variants for about half the price they list for at some point in time. I quite like some of these Sea Wolves lately, especially those with the funky 70’s colours on the jubilee. 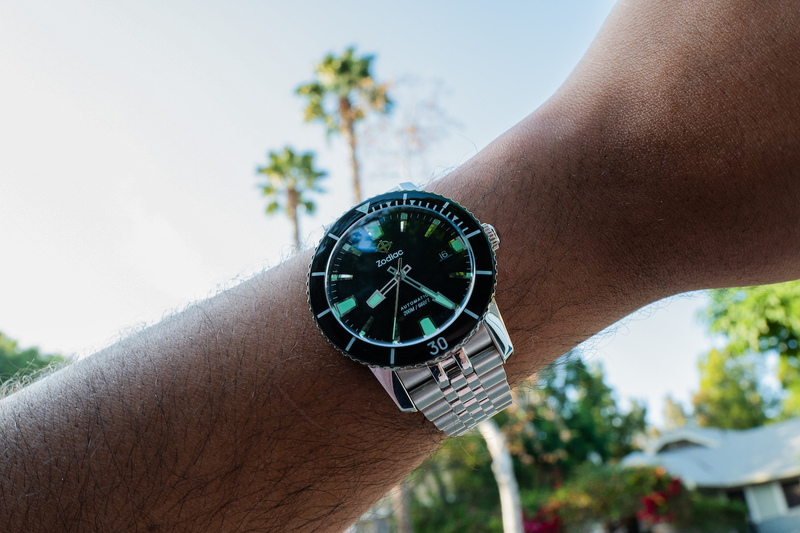 Seems like a great affordable way to get into a fun summer watch.